Home > Welcome to Lawtech Software & Valuation Consulting. Welcome to Lawtech Software & Valuation Consulting. Registered users can download updates for free. Check your version in your program's Help|About menu. SuperSolver software effortlessly produces professional valuation reports under the family law superannuation interest splitting laws. Busy judges & federal magistrates, registrars, legal practitioners, forensic accountants, financial planners and government and superannuation professionals can perform and fully document valuations instantly. At last, you can obtain professional family law superannuation valuations that won't cost a small fortune. We use the latest version of SuperSolver Professional Software to efficiently construct accurate reports, and we pass the cost savings on to your client. In Melbourne, SuperSolver is used by the Federal Magistrates Court, so our results are the same. The reports are solicitor-prepared and include a summary of values, commentary, detailed calculations, resume and supporting materials. In most non-scheme specific cases we will be able to provide valuation of several interests for the price you may be paying now for a single interest. You can download our easy to use valuation-brief precedent, and free-fax it to us for valuation, or a free fee-estimate. This is the latest version of the flagship Calin Professional. It is faster and more powerful than previous versions. A major addition is the ability to calculate 'multiphase interest'. This means that you can stack a number of different types of interest rate phases back-to-back. For example in matters involving interest on an amended tax liability the interest up to the present can go through various phases. The phase can be a rate that changes periodically and compounded daily - then changing to a different variable compound rate - then to zero for a while then back to a different variable rate. C4P can handle these situations easily, as usual producing a very detailed calculation that is easy for professional advisers to charge for. Although the Calin Professional series can be used simply to save time and effort and give a consistently accurate result, that is not the raison d'etre. If that's all you want then Calin Basic will do a good job for you. For professionals who charge money for their time, CP rapidly produces useful information and documents that you can charge money for. Thus the detailed calculations that show how complicated your work is and how much you have done. You can enter new realms of paying-work that would not be economically viable without CP. Reduce your exposure for negligence while increasing client satisfaction. Most firms include 'interest' agreements for client fees but few actually enforce it due to the difficulty of the calculation. Your clerical staff can easily use CP to calculate interest even where there are constantly changing fee balances and changes to your base interest rate. Have you had $15,000 overdue across the whole firm for six months? Even at 10% that would easily pay for CP. The repayment planner adds a seriously effective tool for dealing with debts, and clients will love you for it. And more. More information soon. 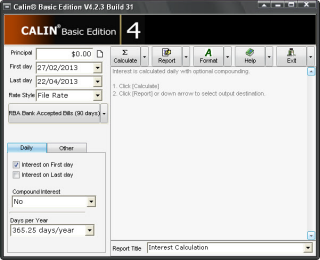 Primarily designed for Australian litigation lawyers and debt recovery, Calin is a quick and easy solution for calculating simple, tiered or compound interest and repayment plans on contracts and for litigation purposes. Calin provides quick and professional solutions to a common need felt almost daily by every litigation, commercial and accounts department within the legal profession and business organisations. 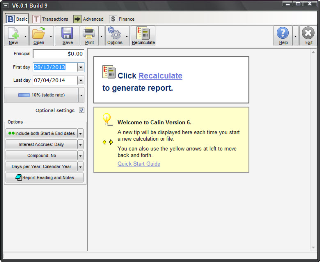 The Ultimate Date Calculator is a heavy-duty date calculator for business, government & professional use. Calculate interval between two or more dates with option to skip defined days. Add days months and years. Perpetual calendar. Chronologies even across time zones. Collate recurring dates e.g. pay and loan repayments. Calculate plans & schedules with reusable templates. Pro-rata accounts automatically. Display person's age and star sign. Julian date conversions. Saves to file. • produce reports that are suitable for professional use.